A recent headline for the Toronto Star reads: “New face of Canada isn’t pretty.” The national affairs columnist, James Travers, writes, “The confluence of domestic politics, Christian fundamentalism and foreign policy is now so strong that Israel’s tail is wagging Canada’s dog.” Yves Engler’s latest book, Canada and Israel: Building Apartheid, reveals that Canada’s stance vis-à-vis Israel is hardly new. Engler also claims that another country is wagging Canada. The cover of Canada and Israel: Building Apartheid speaks loudly. There is an illustration of a wall, obviously alluding to the barrier built by Israel — called the Apartheid Wall — much of it inside what remains of that part of historical Palestine on the west bank of the Jordan river occupied after the 1967 War that Israel unleashed against Egypt. In 2004, the International Court of Justice ruled, by a vote of 14-1, that the Apartheid Wall was illegal, its construction must be ceased and reversed, reparations paid to Palestinians, and that all states are obligated to take action (13-2), and that the United Nation’s General Assembly and Security Council should act. Subsequently, the UN General Assembly passed a resolution, by a vote of 150-6, demanding compliance with the world court’s decision. Canada abstained from the vote. Canadian patriots pride themselves on Canada’s reputation as an honest broker in the world, and they delight in telling how Americans pin Canadian flags on their knapsacks when abroad. Here is where Engler derives much credibility. His critical writing is not fixated on crimes outside his homeland; instead he focuses on the complicity and commission of crimes by Canada. Engler opens a window on the morality of Canada’s behavior in the world. Engler acknowledges Canada’s ongoing, historical abuses against the First Nations of Turtle Island, but he does not define it as, or having been, apartheid. Canada is a state erected by European colonists on the dispossession and “slow-motion” genocide of the Indigenous peoples. Israel is also a state established by European colonists through the dispossession and genocide of the Indigenous peoples. Early in its history, the Canadian state enacted laws and policies that unquestionably personified apartheid. The Original Peoples were placed in small reserves; a people never poor pre-contact became impoverished; the prison population became (and remains) inordinately Indigenous. Although the legislated apartheid in Canada is mitigated (the fearsomeness of the genocide allowed for assimilation as a policy of disappearing the other), the results of the dispossession and genocide still linger. Canadian government indifference to the suffering of others is not atypical. Engler shows that just as Canadian opposition to apartheid in South Africa lacked any conviction, so has any pretense of opposition to the apartheid against Palestinians lacked conviction. *****Engler documents the involvement of Canadian authorities (diplomats, judges, politicians, governor generals, and prime ministers) in realizing Zionist aspirations in Palestine. Canada had a major role in pushing through the United Nations partition plan for a Jewish and Palestinian state. Palestinians boycotted the group charged with investigating the “conflict” – UN Special Committee on Palestine (UNSCOP); they held that UNSCOP denied them their rights and self-determination guaranteed under the UN Charter. During the partition planning, Canada towed the American line, an adherence that Engler finds Canada has followed ever since. Engler documents Canadian partnerships with Israel in intelligence, security, and business. Canadian Security and Intelligence Service (CSIS) works closely with Mossad. Mossad has abused Canadian passports in the past – something known and covered up by Ottawa. The author questions the purpose of the border management and security agreement with Israel – a state Canada shares no border with. Militarily, Canada invited the Israeli airforce to train in Canada. The author details further cooperation, such as in communications and surveillance. Engler says the presence of foreigners fighting for the Israel Defense [sic] Forces (IDF) is a powerful symbol. Although illegal, recruitment from Canada staffs the IDF. Engler reports that early on, about 1000 Canadians fought to help establish Israel. Canada has also been a fertile ground to raise funds for Israel. Engler informs that Canadian Jews sent $100-$200 million in 1991 to Israel; with inflation this amount may be double now. In 1997 Canada entered into a “free trade” agreement with Israel that has featured a consistent trade deficit for Canada. Israel has eponymously “recognized” (social justice activists would argue “shamed”) Canada’s support. Engler writes of a Canadian forest, Canadian village, Canada Park, and Galil Canada in Israel. Engler convincingly delineates staunch Canadian political support for Israel. It doesn’t matter which of the two largest vote-getting parties is in political power in Canada, much like in the US. The Conservatives and Liberals are both pro-Zionism. As Engler reveals, this hardly changes with the left-of-center New Democratic Party or the centrist Green Party. Amazingly, there is no call for reciprocity by the Jewish country and peoples. Chapter 8 is entitled “The world’s most pro-Israel country.” This is unsurprising given that a former prime minister Paul Martin stated Israel’s values were Canada’s values. His successor as prime minister, Stephen Harper is the world’s only state leader listed as a Hasbara member. Engler provides examples from many prominent Canadians. Engler details the lengths Canada will go to side with Israel. For example, Canadian hypocrisy is evident in relations to Hamas and Likud. The “radical” Palestinian group is shunned and the “radical” Israeli group embraced. Indeed, instead of promoting peace, Ottawa and Washington have pushed for civil war among Palestinians — setting Fatah against Hamas. *****Canada promotes its image as a tolerant multi-cultural state where racism is abhorred and human rights for all are respected. Yet not all are regarded equally states Engler: “Ottawa supported recognizing discrimination against Jews as a unique phenomenon, not one among many forms of bigotry.” [italics added] This smacks of a supremacist attitude: that the discrimination against one group is held to be special in contrast to the discrimination faced by other groups. In fact, discrimination against Jews is unique. It is rare that a group so discriminated against could thrive so extraordinarily financially, in media portrayal, education-wise, politically, and conduct itself with such impunity. Many groups would welcome the results of such discrimination. The prejudice toward Israel’s chosen enemies is clear from the comments of former Bank of Montreal president and CEO Tony Comper who warned “a second Holocaust” was possible if Iran acquired nuclear weapons. The racism is palpable in that Iranians are considered to have evil intent with nuclear weapons while Jews escape such criticism, even though they started the weapons nuclearization of the Middle East. Canada and Israel: Building Apartheid discusses the covering role of the Canadian media for Israeli crimes, complicit universities, Canadian politicians accepting political junkets to Israel, the impact of The Lobby, and the chill on freedom of expression. For logic to hold, the premises must be sound. A common logical fallacy is to appeal to authority. The mere fact that Noam Chomsky asserts something does not make it true anymore than if another figure claims that The Lobby holds sway over US policy would make that the reason for the design of the Canadian policy. For Chomsky’s hypothesis to be accepted, it must be explored, challenged, and compared to competing hypotheses. Still knee-jerk support of US empire’s dictates does not necessarily imply acceptance of the rationale underlying such policy. Moreover, Canada and Israel: Building Apartheid attests to the efficacy of Jewish fund raising; the shutting down of charities benefiting Palestinians; the recruitment of Canadians for the Israeli military; cooperation with Mossad (to the extent that national identification documents such as passports are misused); the negotiation of a favorable free trade agreement for Israel; that any voices raised against Jewish racism is met with the charge of anti-Semitism or self-hatred; the influence of Zionists within academia, along the political spectrum, inside labor circles, in the military, business … Engler also cited evidence of Canada abandoning the US lead should it not sufficiently support Israel. It seems that Engler has provided mega-evidence of a powerful lobby. Add to this the government of Canada’s recent cut in funding to the Canadian Arab Federation; cut to KAIROS, a mainstream Christian religious organization critical of Israeli crimes (it appears that Jewish interests outstrip Christian interests); attacks by the government on other human rights groups, such as Rights and Democracy [for failing to have a Jew on staff; 2006 data indicates 393,660 Jews in Canada (1.2%), so if Rights and Democracy hired by percentage of the population then it faced the impossible feat of hiring half a Jew (there are 45 employees at Rights & Democracy)]; the suggestion by the governing Conservatives that the opposition Liberals were guilty of “incitement to anti-Semitism”; etc. *****Engler deserves credit for taking a stand, but in treating such a contentious issue among progressives with superficial analysis, it serves as a bit of a distraction from the apartheid he opposes. It would have been preferable to cite the existence of alternative or mixed hypotheses for readers to ponder. However, there is no need to get bogged down on the primacy of control exerted by Big Oil or a hyper-influential lobby. What underlies the support of apartheid and the oppression of Palestinians is important. More important than pinning causality is ending the oppression of the Palestinians. The machinations of The Lobby as the well as the crafting of foreign policy by Canada and the US all contribute to Palestinian suffering under Zionist apartheid, so it is self-evident that all of these factors contributing to the oppression of Palestinians must be dealt with. Today, there is a political-capitalist driven policy toward Israel. Nevertheless, Engler writes that grassroots opposition has never been greater in Canada. According to one poll, 52 percent of Canadians believe that Israel plays a negative role in the world. This indicates the numbers are there for a social justice movement for Palestinians. Engler sees the boycott divestment sanctions (BDS) campaign (a main plank of IAW) as one tactic to end Israeli apartheid. He identifies education as key to ending unwitting complicity in Palestinian suffering. For those seeking to educate themselves about Canada’s role in Israeli apartheid, Canada and Israel: Building Apartheid contains much essential information. This article was posted on Tuesday, March 2nd, 2010 at 9:02am and is filed under Book Review, Canada, Discrimination, Israel/Palestine, Racism, United Nations, Zionism. One obtains clarity by saying that imperialism, which subsumes socallled zionism, is land thieving and add with murder in mind. We cannot dig any deeper; we’ve reached rock bottom and adding more words to this clarity wld render it unclear. I suggest that calling land theft “zionism” [or “imperialism”] and implying that zionism is an ideology which can be compared [nobly?] with other isms like socialism, idealism, catholicism, humanism, etc., is a grievous wrong against all indigenese and not just canadian or palestinian. Zionism was invented by zionists. Beats me why even scholars have accepted this label as valid symbol instead as an invention and total fake? In fact, the label does not signify a specialty nor a novelty, but the sameness; i.e., the same criminal behavior by same criminal minds that have been waging wars, killing-oppressing serfs for millennia. I’ve noticed that whenever the discussion of the wall built by Israel to separate the Arabs from Israelis, one salient point is always ignored. Before 1967, when Israel captured the West Bank and Gaza, the Arabs kept the border sealed so that no Arabs (other then those attempting to attack Israel) were allowed to enter Israel. Israel opened up that border completely! Israel only put up the barrier after repeated attacks. Considering that Israel opened up the divider that had been closed by the Arabs, it is mind boggling to accuse Israel of apartheid! 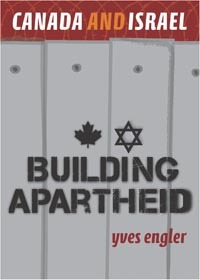 Yves Engler shows devastatingly and with thorough documentation that Canada has been continuously a strong supporter of Zionism and the state of Israel and its oppressive policies, in denial of the fundamental and basic human rights of the indigenous people of historic Palestine. It is also of relevance to point out here the role of the Canadian Jewish National Fund [JNF] in using Canadian taxpayers dollars in constructing the infamy, called Canada Park, built on the ruins of the three Palestinian villages, Imwas [the biblical town Emmaus], Yalu and Beit Nuba [my own hometown] that the Israeli army occupied illegally, and without a shot being fired, in June 1967 and proceeded to systematically demolish them, on the direct orders of Yitzhak Rabin, the then chief of staff of the Israel army. This act is a war crime as clearly identified by the Fourth Geneva Convention, and international law and, thus, indicates Canadian complicity in this war crime. Yet the Canadian government continues to allow the JNF to use our tax dollars in maintaining this war crime. All this goes on while Canada continues to brag about being a supporter of international law, the UN Charter and human rights. The definition of these terms clearly needs revision in the Canadian dictionary. Under Stephen Harper government – Ottawa has been colonized by the Zionist entity. According to Toronto daily The Globe And Mail, Canada’s junior foreign minister, Peter Kent, in an interiew with one of Canada’s Israeli Hasbara publications Shalom Life said that Stephen Harper government is ready to throw its full military weight behind the Zionist entity, saying: “An attack on Israel would be considered an attack on Canada”. Kent’s chief of staff, Norm McIntosh defended his boss by telling the newspaper that “It’s not too far from what the prime minister (Stephen Harper) has said”. Stephen Harper and his immigration minister Jason Kenney who supported Israeli genocide of 1.5 million Gaza inhabitantans during Dec.-Jan. 2009 – are known for their blind support for Israel and their hatred toward Arab and Muslim communities in Canada (Edward C. Carrigan in The Canadian Charger, Feb. 10, 2010). Canadian prime minister Stephen Harper has gone to the extreme by saying that criticism of Israel is an old-fashion anti-Semitism. Jason Kenney is on record of boasting that Canada was the first government in the world to remove funding for the Palestinian Authority (PA) following election of Islamic Resistance Hamas in 2006. He was also instrument in banning British MP George Galloway’s entry to Canada in March 2009. Last December, Kenney also cut government funding for Christian charity KAIROS for carrying out some humanitarian work in occupied Palestine. Interesting while KAIROS was labeled anti-Semite, the group in fact recognizes the state of Israel to exist on the stolen Arab land. It only wants Zionist thugs to pull-back from the occupied Gaza, the West Bank and East Jerusalem. Jason took that action on his return from attending the Global Forum for fighting Anti-Semitism in Israel. Actually, “dfault”, it is genocide, slow motion or otherwise, but it is an ugly, ongoing genocide against the Palestinian people. I don’t regard the wall as an “Apartheid Wall”. It is part of a monstrous land grab, a creeping transfer, taking whatever parts of Palestine it wishes as it looms longer and larger over the Palestinian homeland, destroying entire villages and all else besides in the process. If this were a ‘security barrier’ as life long terrorist, Ariel Sharon, brazenly called it, it would have been built inside the so-called Green Line. It wasn’t. Enough said. Furthermore, it has been declared illegal by the International Court of Justice, and ordered dismantled. Why it hasn’t been speaks volumes to the cowardice of the nations of the world and to the inability of the ICJ to enforce its decisions.. The occupied, oppressed, terrorized Palestinian people are the ones needing protection. Long before Israel’s 1967 unprovoked attack on Egypt, Jewish terrorists were killing the native people, destroying their towns, and forcing close to 900,000 to flee their homeland. The 1967 pre-emptive strike was another excuse to accumulate additional land that didn’t, and doesn’t, belong to Israel. Tragically, no wall has, or will, protect the Palestinian people from the tanks, bombs, missiles, white phosphorous, gun boats, and all else besides that the IDF, terrorists in every sense of the word, delights in dropping on an innocent population. “The Palestinians would love to hit back with F-16 jets, tanks, helicopter gunships, armed drones and naval gunboats. That would be nice and conventional and acceptable, yes? But all they have are AK47s, RPGs and rockets made in the garden shed, and they ride into battle in a pick-up truck”. Your pat little analysis, ‘dfault’, about Israel’s illegal wall is first class fiction. Instead of the phony usurped so-called “star of David,” the Israeli flag should have the horrid wall as its face for all the world to see. This would best reflect the essence of Israel as not only an apartheid state as pertains to the Palestinians but also to the “other,” the rest of humanity in its entirety. UK members of the parliamentary delegation to Gaza, organised by the European Campaign to end siege in Gaza and the Palestinian Return Centre presented ‘Eyewitness Gaza’ in Westminster on Monday evening. Joining the esteemed panellists were Lord Steel, who is going to Gaza this week, Majed Al Zeer Director of the Palestinian Return Centre and Arafat Shoukri, chair of the European Campaign to End the Siege on Gaza. It was a highly anticipated event jointly organised with Labour friends of Palestine following the largest ever delegation to Gaza which comprised of 60 parliamentarians from 13 different European countries and resulting in an authoritative report. The despair and frustration was palpable on an emotional night. ‘This was the most extraordinary experience of my life’ said Bob Marshall Andrews, ‘nothing prepares you for what we saw and heard in Gaza’. Sir Gerald Kaufman, the leader of the delegation, made a very poignant speech noting the responsibility of the UK and the EU to lift the siege. ‘what we saw was collective punishment in Gaza and it is the responsibility of the people of this country and western democracy to remind everyone of the atrocity taking place every day before our eyes’. ‘Gaza was worse than I ever thought’ said Sir Gerald ‘it was incredible and callous destruction’. With the trauma inflicted on Palestinian children, sir Gerald argued that Israel was condemning itself; it is harvesting a generation of disaffected children driven with rage and anger at the injustice and intolerable situation imposed on them. Lord Ahmed, a member of previous delegations, spoke of the total hypocrisy of the policies adopted in the region. In mentioning the 2006 election win of Hamas he said ‘the British government was prepared to engage in a long bloody war which killed hundreds of thousands in Iraq with the intention to spread democracy and here in Palestine there was democracy in action, not dictated by the barrel of the gun and we spurned it’. Jeremy Corbyn spoke of his personal anguish in coming to terms with the terrible conditions, ‘ I felt bitter, frustrated, angry and unworthy’ he said, in describing his emotions of witnessing the conditions in Gaza and personally struggling to come to terms with the situation. Richard Harrett, Labour MEP said ‘the ability to make peace was disappearing’ after reflecting on the situation in Gaza. He echoed all the previous speakers’ sentiments that the EU had to take effective measures, which it has in its disposal, such as maintaining its refusal to upgrade the EU Israeli trade agreement and pushing for it’s suspension in line with Article 2 which dictates respect for human rights. Dr Arafat Shoukri then spoke of the work of the European Campaign and its continued effort to address the humanitarian crises and facilitate the political process, ‘this was a human disaster where many authorities were complicit and should feel ashamed’ he said. Majed al Zeer, Director of PRC, provided some historical background to Gaza saying, ‘Gaza was not the first and I’m afraid won’t be the last’. Gaza, he argued was the continuation of a single problem which is the Palestinian Nakba (catastrophe). ‘The Nakba was there before Hamas and before Hamas rockets, the Nakba was there before the PLO and Arafat, the Nakba was there before any Palestinian resistance, so called extremism and terrorism. Israel has made Nakba the eternal condition of Palestinians and has continually tried to erase its crimes against the Palestinian people’. Conservative MP, Peter Shurman, told the Jewish website, Shalom Life: “If you’re going to label Israel as apartheid, then you’re also calling Canada apartheid and you’re attacking Canadian values”.